My name is Sandra Yagi, and I’m an artist living and working in San Francisco. I am very fortunate that my works will be exhibited at Bash Contemporary Gallery. I’ve worked over the last 6 months to get ready for the exhibit, which opens on November 14. I choose my next painting project based on an assessment of the completeness of an idea, and whether or not it is compelling. If the concept seems forced or hackneyed, it is tabled or totally written off. Some ideas percolate for years, and others occur at the spur of the moment. Several of my paintings in the Bash exhibit share a common theme. I am very concerned about the environment, and often I am very disheartened by humanity’s greed and selfishness, which I believe are the root causes of destruction. This feeling definitely found its way into my recent paintings and has always been a part of my work. 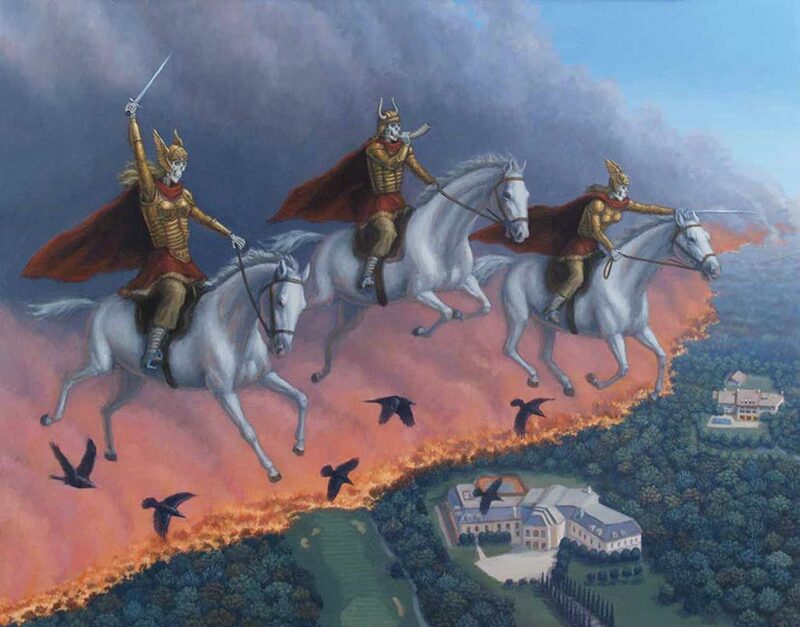 One of the central paintings in the show is “Ride of the Valkyries”. It portrays three skeletal figures in golden armor riding white horses over a burning landscape, accompanied by several crows. In Norse mythology, these goddesses select those who will live and who will die in battle. In this painting, they are heralds announcing the destructive effects of global climate change. In the landscape below them, the mansions owned by the super-wealthy elite are about to be engulfed by the flames and no amount of money will save them. In the painting “Regeneration”, a human skull lies on a forest floor. A sapling has burst out of the skull, and colorful tree frogs are climbing about in the leaves. 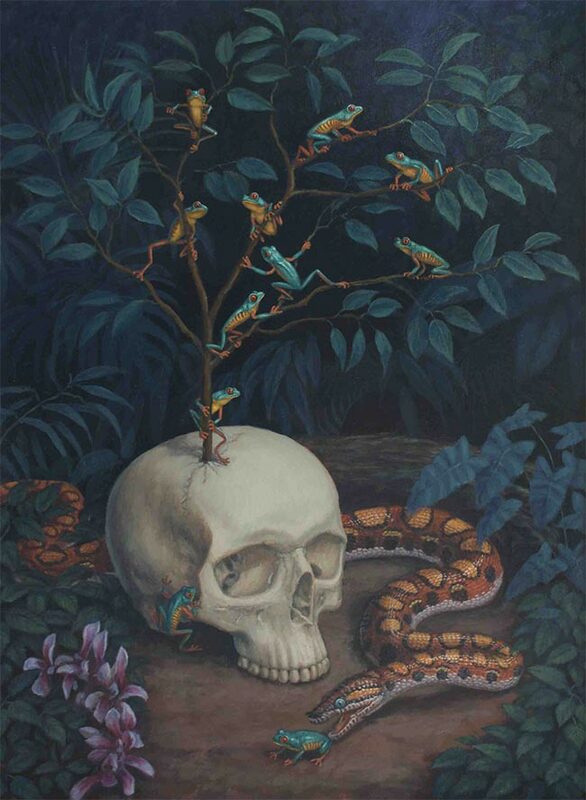 At the base of the skull, a snake is about to strike at a tree frog. This encapsulates my feeling about humanity: if humanity disappears from the planet, nature will burst forth in new leaves and color. The cycle of nature, symbolized by the snake, will be allowed to function without our interference. Scientists have disclosed that we are in the midst of a great extinction event. In this case, it is brought on by a single species, Homo sapiens. The most recent painting I finished is “The Last Rhinoceros”. 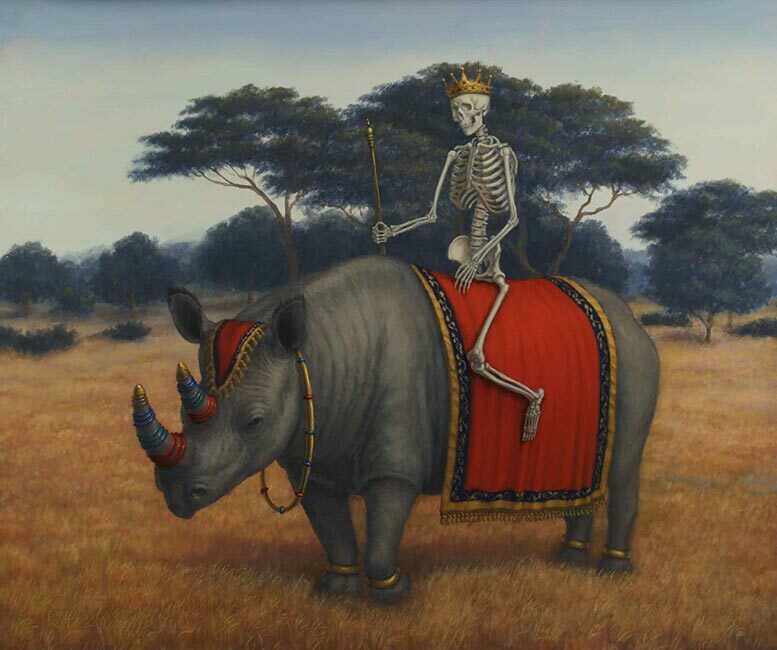 A crowned skeleton riding atop a magnificent rhinoceros symbolizes death at the hands of humans. She is the last of her kind, and so she is celebrated, because she will soon be stuffed and mounted. She is decorated and admired, but soon, she will be gone. I felt a profound sadness as I worked on it. I am happy that the painting turned out the way I envisioned it, but at the same time extremely distressed about the state of the environment. When I was a kid, I would look at photos of Africa, and it looked so wild and beautiful. Now, I see photos of slaughtered rhinos and elephants, and of rhinos accompanied by an armed guard to protect them from poachers. The virgin wilderness is long gone, and our children will know of the great mega fauna as stuffed museum pieces, or specimens in a zoo. The vast open lands of the African Savanna or the uninterrupted sea of green in the Amazon will only be a distant memory. Yes, I am very pessimistic, and often get depressed by the destruction of nature. But for me, making art is an act of optimism; we hope that perhaps our art can awaken others in order to make a difference in the world. Beautifully stated!!! SO excited for your opening! !